Over the last couple of years, the Rossi have organised the very successful EJ5K, in memory of two young lads, Eoin Farrell and James Miskelly. Both times the event has resulted in hundreds of people descending on Rostrevor Square to run or walk the 5 Kilometre route around the outskirts of our beautiful village. As a volunteer led group, we rely on the good will of several businesses, clubs and groups to help us try to make it as safe and successful as possible while giving the participants the best experience whilst taking part. At the centre of the successful execution of any event is the location where you welcome the participants, sign them up before and then feed them after. And location location location is the key criteria to any Event Centre. We are quite lucky in Rostrevor, because we’ve got a Shed. Now when you say shed in this country it conjures up many visuals, it could be the old brown shack your Granda had at the bottom of his garden, or it could be a huge green thing, made of corrugated tin that you keep tractors and cattle in. But we’re different here in Rostrevor, we keep men in ours. Men from all over the globe, with unusual accents, sizes, shapes, hair colour (including invisible) … now you’re thinking of Magic Mike and the lads…. But it’s not quite the same, but they do have a Magnificent Mark with a french accent! 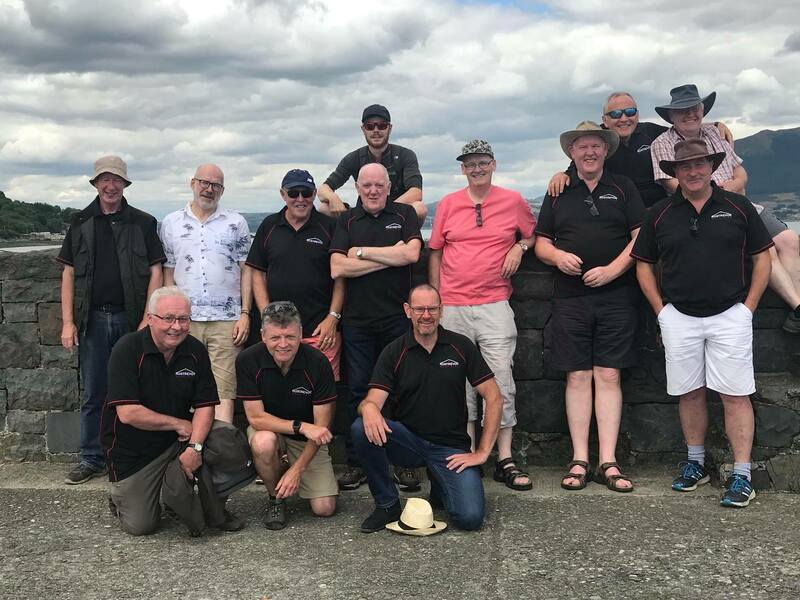 It’s the Rostrevor Mens Shed, a group set up a couple of years ago to create a space for men of all ages to come together and just do what men do. They do a lot of stuff, they make stuff, grow stuff, listen to stuff, learn from stuff, create stuff, visit stuff, enjoy stuff, laugh about stuff, sing about stuff, read about stuff, make more stuff, clean stuff, enrich stuff, repair stuff, win stuff, but ultimately they support stuff. Even though the Rostrevor’s Men Shed is only a few years in existence, it is an integral part of village life for a lot of men and their families and the beauty of this shed is it’s accessibility for all of its members being located right in the village square. It is located at a council owned property in the Square and they have repurposed the interior for their welcoming meeting rooms. The members have also spent the last two years transforming a once overgrown garden into a botanical marvel with exotic fruit, vegetables and flora growing happily in Rostrevor’s micro climate. The bus stop is just across the road and has a carpark straight outside, so all of it’s members can access it with ease no matter their chosen form of transport. These ‘Shedders’ are now a point of contact for support for many groups across the village and at every opportunity get involved in supporting and improving village life, while supporting each other ‘shoulder to shoulder’, improving Rostrevor’s Mens Mental Health, learning from each other and passing on any valuable knowledge and experience when required. The ‘Shed’ itself being located in the centre of the village square has become a community hub that you couldn’t put a price on. This ‘Shed’ being located in the Square doesn’t just grow tomatoes, it has grown friendships. It hasn’t just made wooden planters and clocks, but crafted renewed hope and support for all of it’s members and they are only getting started!